Thomas Rosenberg is nationally known as a dynamic performer, chamber music coach, and teacher. Since 1981 he has been Artistic Director of the prestigious Fischoff National Chamber Music Competition (www.Fischoff.org) through which he is a recipient of the 2007 Indiana Governor’s Arts Award, the highest honor in the arts from that state. 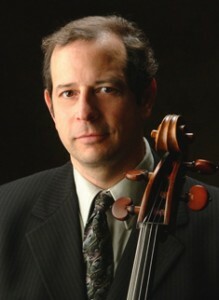 A resident of Saint Paul, Minnesota, he is currently on the faculties of Macalester College, Carleton College and the McNally Smith College of Music teaching cello and coaching chamber music and has served as String Chamber Music Coordinator and primary coach for the University of Minnesota School of Music. He also maintains The Opus 1911 Music Studio (www.tomrosenbergmusic.com), a busy private studio of pre-college cellists and chamber ensembles featuring many of the regions most outstanding young artists. Mr. Rosenberg was awarded the prestigious McKnight Performing Artist Fellowship Award in 2004. He also has received top chamber music prizes at the Munich (Germany), Portsmouth (England) and Chicago Discovery Competitions, and is a three-time Naumburg Chamber Music Award finalist. His freelance activities include numerous solo and chamber music recitals, performances with the Schubert Piano Trio, The Isles Ensemble, Minnesota Public Radio and performances as an extra musician with the Minnesota Orchestra and the Saint Paul Chamber Orchestra. Mr. Rosenberg was a founding member of the highly acclaimed Chester String Quartet with whom he made numerous recordings and for twenty years, appeared on concert stages and live radio coast to coast in the United States, Canada, Central America and Europe.